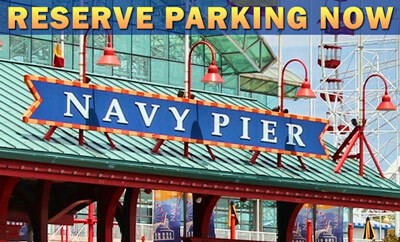 Convenient parking for the Navy Pier is available at the following parking locations. Click the location address to see more information about parking. Located along the shoreline of Lake Michigan is Chicago's number one tourist attraction, the Navy Pier. The Navy Pier serves as a mixed-purpose municipal port that services the cargo industry, lake freighters, and warehouses, while offering outdoor space for public gathering and entertainment. Navy Pier is home to sightseeing tours such as Seadog Ventures, Shoreline Sightseeing, Cruises and Water Taxi Service, and the Tall Ship Windy. Also located at the Navy Pier are Pier Park, the Children's Museum, Smith Museum of Stained Glass Windows, and an IMAX theater. The Navy Pier hosts fairs and expositions throughout the year, such as the popular Strictly Sail Boat Show, Chicago Air and Water Show, Chicago Flower and Garden Show, and Winter Wonderfest.